Warning: spoilers for multiple stories lie ahead. Read at your own risk. Love ’em or hate ’em, plot twists are an integral part of modern storytelling. You know what I’m talking about…those moments in stories that make you go “HOLY CRAP” or “WHAT THAT DOESN’T MAKE ANY SENSE!” But the question is: when is a plot twist good and when is it bad? For my personal taste, a good plot twist is one that makes you reevaluate what came before. To start with, I’m going to use an example from something I’m betting not all that many people know about: the television show “Fringe”. For those who’ve maybe never watched the show, it’s similar to “X-Files”, only instead of investigating weird, far-fetched supernatural stuff they investigate weird, far-fetched science stuff. The basic premise is this: FBI agent Olivia Dunham investigates after everyone aboard a commercial airline flight is killed by a strange contagion that caused their skin to fall off (in spectacular, gooey fashion). The case leads her to Dr. Walter Bishop, a man known for extreme experiments in science…who is also now in a mental health facility. Because of the facility’s rule allowing only family members to visit, Olivia must track down Walter Bishop’s estranged son Peter. And this is where, if the twist is good, your mind goes into overdrive. You start seeing the clues, putting the pieces together, realizing that certain little things you initially thought were innocuous actually hinted at a bigger truth. In this case, the truth is that the Peter we know in the show actually belongs to a parallel universe. And, in this case, your mind is likely to go back to a scene earlier in the season where Walter is talking to Peter and mentions a time when Peter was deathly ill. Walter says he became consumed with saving him, but that Peter eventually just got better. Obviously, with the twist at the end of season one, we know that’s not what happened and Walter’s version of Peter died. There are also other, smaller hints throughout the season that you’d probably never catch on your first viewing. For example, during one very early episode, Walter is rambling about eye color when he says Peter’s eyes are green. But when we cut to Peter, we can clearly see that his eyes are blue. Initially, you likely brushed it off as just Walter being not altogether there. However, with the added information we get at the season’s close, it takes on a newer significance. Same with another scene where Peter is holding a G.I. Joe toy and says something like “weird…I always remembered the scar being on the other side”. Again, innocuous on its face, but hinting at a greater truth. Another great instance of this kind of plot twist comes from “The Sixth Sense”. I’m sure most, if not all of you, know the story by now: Bruce Willis plays a psychiatrist who helps a young boy that claims he can see ghosts. Spoiler alert: Bruce Willis is actually dead the entire time. He’s just another ghost that the kid can see. But what’s genius about this twist is that unlike “Fringe”, where most of the clues are only really recognizable upon re-watching the first season, “Sixth Sense” actually replays snippets of scenes from earlier in the movie during the climactic reveal, giving them new meaning and context. That scene with his wife in the restaurant? It shifts from being the portrayal of a couple falling out of love to that of a widow grieving for her lost husband. And it doesn’t even show all the clues the movie had in it. There’s actually a scene where Bruce Willis is standing behind the kid as the kid reaches for a doorknob. There’s a quick close-up shot of the knob that shows that Willis has no reflection. It’s truly crazy how much foreshadowing the movie does right under your nose. Now let’s move on to the other side of things. When is a twist bad? For my money, it’s simple: when the twist is done for pure shock value and offers very little payoff. For example, one of the seasons of “24” reveals that the president of the United States (or former president at that point…I can’t remember for sure) is in league with the bad guys to do…something I guess. I don’t remember if there was a good explanation for it. What little I remember tells me it was more done for shock value than anything else. Another example comes from the video game “Call of Duty: Modern Warfare 2”. In the game, a character named General Shepherd sends one of the playable characters to an estate in the middle of a forest somewhere to retrieve data on the enemies operations and help stop World War III. Only, at the end of the mission, Shepherd shoots and burns the playable character alive upon receiving the data, revealing that he was the mastermind behind it all and was just covering his tracks. It’s a moment that screams “epic” at first, but once Shepherd reveals his motivation later on things fall apart quickly. …who will then more than likely die in the ensuing global conflict, leaving General Shepherd with a far larger body count than he would have had otherwise. It’s best not to think about it too much. Another example of a twist that underperforms is in “The Village”, another movie by M. Night Shyamalan. For my part, I actually liked the twist itself. But at the same time, I admit that it does have a lack of payoff for the story. The plot of “The Village” is as follows: a colonial era village lives in fear of monsters that lurk in the woods around the town. But later on, it’s revealed that the monsters are nothing more than the village elders wearing outfits in an effort to keep people from moving away from the village. And the noises they keep hearing in the woods are made by things like wind chimes. Then, at the very end, it is revealed that the movie actually takes place in modern times, with the village elders starting the village in the 1970’s as a way to escape the traumas they experienced in modern society. They’re basically an Amish-like cult. While the twist is cool, there’s very little payoff for it. We already know that the spooky noises are fake and that the monsters are just old people in costume. It does give us an explanation for why the elders did all those things, but it doesn’t feel very satisfying. It feels…anti-climactic in a way. Not only that, but the twist has some serious explanations with plausibility, the most notable of which being how did no one ever see a plane flying over the area? The movie tries to explain this away by saying they set up a no-fly zone over the area the village is set in, but it still seems far-fetched. I could talk about more plot twists, but that would make this post go on longer than it needs to. And it’s already long as it is. So to recap, for a plot twist to be good, it needs to redefine or alter the arc of the story in a way that makes sense. Twists that are thrown in there for shock value (which is something broadcast television shows seem obsessed with these days) tend to collapse under the weight of their own implausibility. The quality of twists can be highly subjective, but in the end I think most people would agree that it needs to be logical. It needs to follow some sort of common sense. Otherwise, its artificial nature is plainly obvious for everyone to see. A little over a year ago, I wrote a post called “What’s in a Story? The Importance of Narrative Fiction” where I talked about, what else, the importance of fiction. I decided I wanted to write a second part to it, specifically talking about what makes a story entertaining or engrossing to people. The most obvious thing right out of the gate is characters. Everyone loves a good character in a story, whether they’re good or bad. Sometimes, we find that we may enjoy the villain’s side of things more than the hero’s. This was definitely true of the first season of the Netflix show Daredevil. This is not the say that the hero, Matthew Murdock, was any kind of slouch in the proceedings. He had a very nice bit of conflict throughout the season where he was constantly confronting himself about how far he was willing to go. But in the end, Wilson Fisk (the villain) stole the show for me. I won’t spoil anything for those who haven’t seen the show yet, but Fisk’s backstory is incredibly disturbing, depressing, and gripping. He’s one of those villains that actually has a noble goal, but the means he is using to get there are very much a problem. Without the conflicting nature of Fisk I doubt the show would have been nearly as engrossing of an experience for me. It’s one of those strange experiences where you actually understand where the villain is coming from, which isn’t something we often get from modern superhero fare. This is what characters can do for a story. They inject it with life. They give it a lasting impact, make it stay on your mind for a long time after its inevitable conclusion. This is a big part of the reason why movies like Interstellar stay with me for so long, because the characters in it are so well written. They give the world they reside in a certain believable quality that it otherwise wouldn’t have. They are the people who you follow through the story, beginning to end. But characters aren’t the only thing that can engage you in a story. It’s the obvious thing to turn to when talking about books or movies, because they are by their nature scripted and focused. But what about video games? Games can have great characters and story on par with movies (just check out the Uncharted video game franchise for an example of an action movie turned video game), but there is also a sense of agency that the player of these games has. He can choose where to go and what to do to a certain extent, depending on how the game itself is designed. 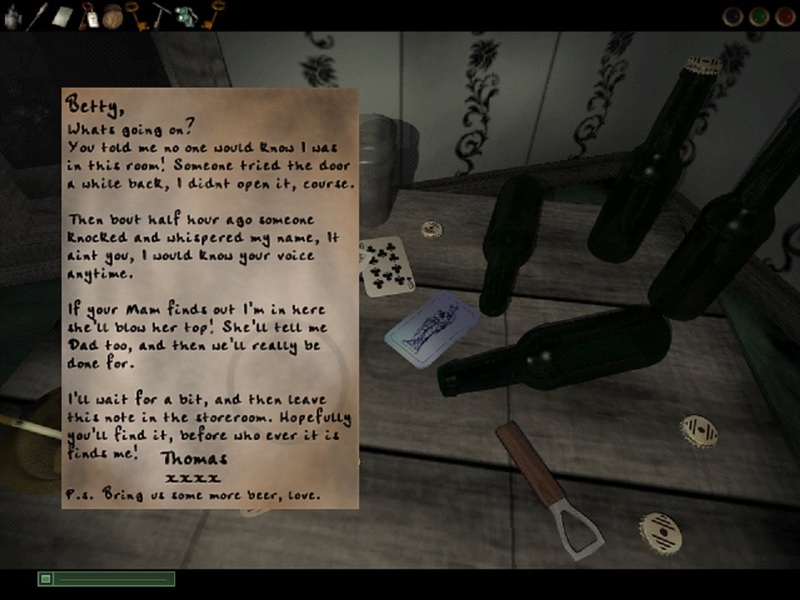 Some games, like Myst, take advantage of this agency, driving the player to explore and discover the story on their own. But what makes the story of these types of games engrossing? What makes them tick? The answer lies in the setting. Setting can have a major impact on any story, be it in a game, book, or movie. But it can have special significance in a game, being that the interactive nature of the medium often immerses you in it in a way that books and movies can’t touch. In a book, you imagine the setting in your mind. In a movie, you follow the setting as the director and writer have envisioned it. 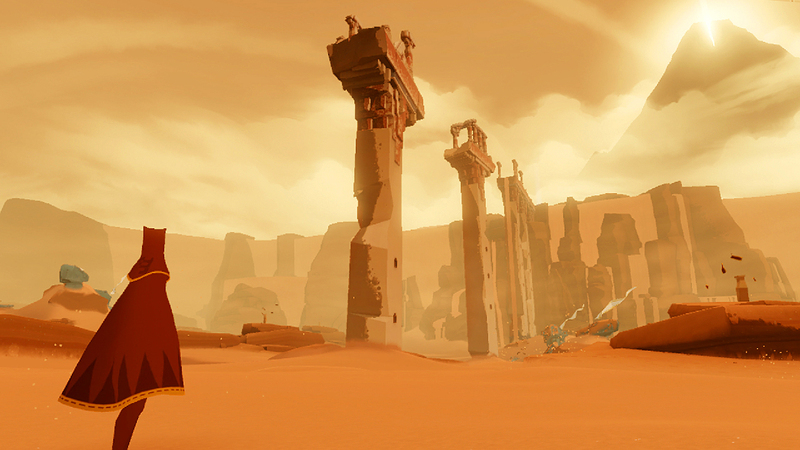 In a game, you decide what places to explore and what is important. Of course, the game developer has to design the setting, so in essence you are still seeing exactly what the person who created it wanted you to see, but the little details the designer may not have found important might speak to you in a way that they didn’t anticipate. In Dark Fall‘s case, your character is merely a shell, a way to interact with the world and its characters. The people in this game are no Walter White. They won’t regale you with a gritty story of succumbing to greed and slowly transforming into a monster. They’re just ordinary people who lived their lives. But the way the game presents their stories is what makes it so interesting. Whats going on? You told me no one would know I was in this room! Someone tried the door a while back, I didn’t open it, course. Then bout half hour ago someone knocked and whispered my name, it aint you, I would know your voice anytime. If your mam finds out I’m in here she’ll blow her top! She’ll tell me dad too, and then we’ll really be done for. I’ll wait for a bit, and then leave this note in the storeroom. Hopefully you’ll find it, before who ever it is finds me! It’s bits like this that made the game for me, these little snapshots of people’s lives that have been left sitting there. Considering you never physically interact with any of these people (they did disappear after all), the little touches are what makes the game so interesting. The style of writing clearly belies Thomas’ out of country origins, and his subdued manner hints at the idea that Betty is the dominant one in the relationship. A little does indeed go a long way, especially where horror/ghost stories are concerned. Dark Fall is effective not because it throws the ghostly nature of things directly into your face, but because of the feeling that these people were just going about their everyday lives, having fun and dealing with personal issues when suddenly they just up and vanished. It’s the sense of a life interrupted. I may have only talked about setting and characters when it comes to making a story tick, but they are by no means the be all end all. There are plenty of ways to make a story engrossing. You can even make a story that has no dialogue entertaining, like the movie Apocalypto (I have admittedly never watched it, but the lack of dialogue was one of its bigger selling points). It all really comes down to knowing what is important in the type of story you are trying to tell. If it’s a horror story, setting can often be more important than character. If it’s a gritty crime story, characters are going to be the driving force. It’s easy to say that a good story is one that’s believable, but harder to say what makes that story believable. And in the end, it’s all about getting the reader/audience/player to be willing to suspend their disbelief, if just for a short period of time. Well that’s all I’ve got for this week. Tune in next Wednesday for another post and as always, have a wonderful week everybody! Anyone who likes to write has a process, a series of steps or phases that they go through when they want to tell a story. Everyone’s process is different in some way, but we all go through the same basic series of steps from the initial idea all the way to the finished product. But as anyone who has written a story will attest, the process can be difficult. Some people get hung up on the initial idea, unable to come up with something or unable to turn their idea into a cohesive story. Some people struggle with writing the story, finding it hard to begin their story, end their story, or even just get from point A to point B within the story. So I thought for today that I’d give you a look into how I do things, my specific creative process. If you do things differently than me, don’t worry about it. Writing is not a formula or an equation. There is no one correct way to do it. I am showing my process merely as an example, with the hope that seeing it all laid bare might help you gather up your ideas and jump-start your own process. So here we go. When an idea hits me, I usually don’t expect it. It can come at any time: while I’m at work, taking a shower, watching a TV show, or even when I’m sleeping. It doesn’t really matter when or where it pops up, just that it does. I have brainstormed ideas before, but I feel that the best ideas come naturally, when you’re not trying to force it. Once I have the idea, I begin the process of shaping it into a cohesive story. But before I even get to the outlining part, I run the idea over in my head. I ask myself some questions. Would this idea make a good story? Is there room for this idea to expand and change? What kind of characters should I have? I ask myself these questions and more to make sure that the story I want to write is one that is worth writing and one that I feel strongly about. Because if I don’t feel good about the story I’m writing, then who will want to read it? Now we get to the outlining, which many people take for granted. I used to never outline things at all when I wrote papers in high school and so on. But over time, I learned that outlining generally makes a paper or a story go much smoother than it would otherwise. An outline allows you to draw a road map of your project, showing where you want to start and where you want to go. How deep you want your outline to be depends on you. My outline consists of four parts: title, setting, synopsis, and major events. The first part, title, is pretty obvious. I use this part to write out what I want the title to be. If I currently don’t have a title at the moment, I use this space to brainstorm until I pick one later. Setting, the second component, is also pretty clear. This is where I write the setting down that I plan on using for the story. This is usually more of a check to make sure that I keep myself consistent. I plan on expanding this section at some point, and use it for greater purposes than I do now. The third part of my outline is the synopsis. For this, I like to imagine that I’m writing a pitch or the description for the story. It’s a brief overview of the story, introducing the main character(s) and the setup for events. I write it like I’m trying to entice, like I’m trying to get someone to read my story. That way, if I ever do pitch it somewhere, I have something written down that I can draw from. The final part is the major events. This is the meat of my outline. This is where I write down all of the major events that I can think of in the story, and describe them in detail. It also serves as a general chronology of the story, showing where it begins, where it goes, and where it ends. Once I actually begin writing the story however, these things are subject to change, either slightly or completely. You may outline your stories in a completely different fashion, yours more in-depth than mine or less. It all depends on the person and the situation. I have sometimes wished that my outlines were a little more in-depth, but I have trouble thinking of a good way to do that without creating excess busy work. As for right now, I’m fine with my outlines. I may change my method in the future, but that’s the nature of writing. It is fluid and ever-changing. This is where most of the work for me takes place. After outlining the story, I usually wait a day to let the outline sink in before I begin writing. And then, I just write. There’s not really much to say about this part, other than that it often takes a period of days, weeks, or even months depending on the size of the story. The most recent story I finished took about a month to write, and ended up being nearly fifty pages. The most important thing to remember during this section is that this is only your first attempt at the story. When you read it back after you’re finished, it may and probably will seem very rough. You’ll find spots that you don’t like, sentences that you can’t believe you thought sounded good. You’ll find spelling errors, grammar mistakes, and just general logic issues abound. If it makes you despair, just remember. You will have a chance to fix things. It’s not like this is the version people are going to read. The next part of the process is where I make the version I want people to read. Once I’ve finished the first, or “rough”, draft of a story, I like to let it sit for at least a day before I go back to it. Trying to immediately revise a story after you’ve finished it is a fool’s errand. You will only glaze over obvious mistakes in your writing, because you’ve become too close to it and spent too much time with it. The most important part of revising is to let some time pass before you take a look at your work again. It gives your mind a chance to refresh itself and let go of innate biases. I used to wonder how many different revisions of a story I should do, and the answer is simply that there is no answer. Like I said, writing is ever-changing. There is no concrete method or answer for it. You have to make your own path, which I understand is incredibly difficult for some people. Some people want a basic formula or an equation when they do things. They want there to be one correct way of doing it, with the only obstacle being the journey to get to the predetermined end. People like that usually don’t do too well with writing, not that they’re failures or anything for it. They’re just built a different way. I learned recently that when it comes to revising, it is a good idea to try to focus on one particular aspect of your work for each revision. For example, on one revision you could focus on spelling and grammar. On another you could focus on character consistencies. On yet another, you could focus on logical issues with the story, asking yourself “does everything make sense within the world” and so on. So that’s what I try to do now with revising. I used to just read over the story and change anything that popped out as wrong or odd to me, but now I’m trying to do it differently. Revising is a tough job, because you aren’t always sure how much you’re really doing to it. This is the part of the process where it’s a good idea to get other eyes to read your work. Send your story to a friend or two to read, and have them tell you what they think and point out anything they don’t like or that they think doesn’t make sense. You don’t have to do everything they say (because then it would be more their story than yours), but do take their criticism to heart, and use it to create the best possible story that you can. And sometimes, you may want to even scrap the story you have, and start all over. I know I’ve done that with a couple of stories before. But most of all, write what you feel and never apologize for it. That’s all I have for this week. Tune in next Wednesday for a new post, and until then, have a great week everybody.